Features : A. Competitive Prices help you get new clients, High Quality products help you maintain old clients. B. Non Disclosure and Non Compete agreements are both respected. - Temperature :- -20°C + 60°C. We are offering Valve Metal Cable Tag. We are presenting our clients an attractive range of Engraved Label. These labels are designed and developed using supreme class raw material with the help of latest tools and technology. Our offered range is available in various shapes, sizes, colors and can be customized as per the clients’ requirements. Exco Graphic India Pvt. Ltd.
We are involved in prtinting of Engraved Label. We are one of the leading manufacturer and supplier of Engraved Tags , we are supplying wide range of quality products with efficient pricing. Symbolic to all the success we have acquired in the industry, remains our status as a prominent enterprise engaged in offering Engraved Labels. Being one of the reckoned enterprises in the market, we are offering an optimal class gamut of Bakelite Engraved Label to our patrons. Owing to our rich industry experience and our expertise, we are offering Engraving Tag of outstanding quality to the clients. 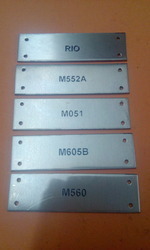 We have come up with unique and diverse range of these Engraving Tag. These tags are customized according to the client’s specification and could be availed at leading market prices.